Elle and Fandango Are Giving Away 100 Pairs Of Movie Tickets. Want One? 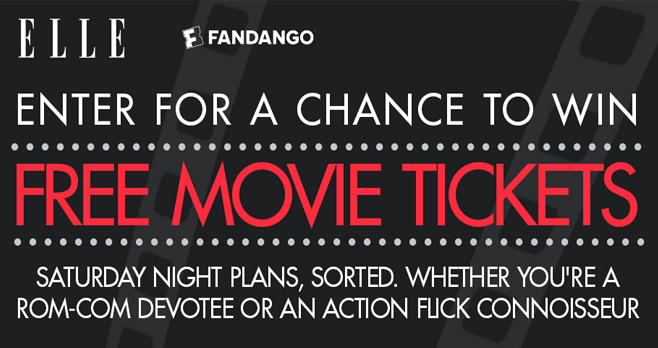 One hundred lucky readers will receive a pair of movie tickets, awarded in the form of a a Fandango promotional code. Each code may be used to redeem a pair of movie tickets on www.fandango.com or via the Fandango mobile app, for a Fandango partner theater in the U.S. Whether you’re a rom-com devotee or an action flick connoisseurs, your Saturday night plans are all sorted! The ELLE Fandango Sweepstakes is open to legal residents of the 50 United States and the District of Columbia, who have reached the age of majority in their state or territory at the time of entry. You may participate once per day between 12:01 AM. ET on October 18, 2016 and 11:59 PM ET on November 14, 2016. All winners will be selected within one month of the last day of the Sweepstakes in a random drawing from among all eligible entries received. The total approximate retail value for all prizes awarded is$4,000. The Sweepstakes is sponsored by Hearst Communications, Inc., 300 W. 57th St., New York, NY 10019. Now that you know more about the ELLE Fandango Sweepstakes, you are ready to participate. To enter, visit www.elle.com/fandango on a computer or wireless device and complete the online entry form as directed. Then, submit the form accordingly. Once done, you will automatically receive a Sweepstakes Entry for that repeat. Repeat each and every day during the Sweepstakes Period for more chance to win! For complete details, including Official Rules, visit www.Elle.com/Fandango.